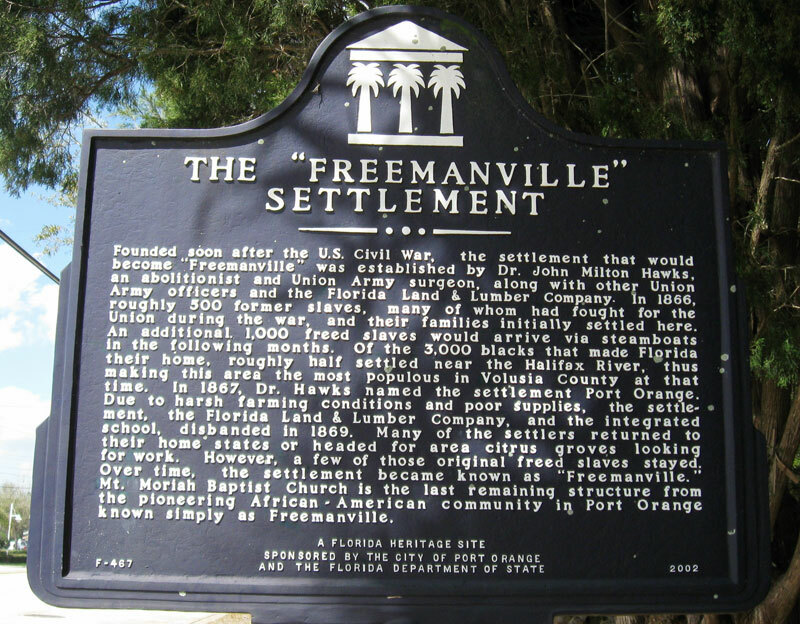 State landmark denotes the location of the abandoned community of Freemanville, settled by 500 freed slaves near the Halifax River in Port Orange in 1866. Click to zoom and read. Below, Mt Moriah Baptist Church, the last remaining structure in Freemanville. Freemanville, the site of the first African-American community in Volusia County, remains generally unknown, but once a year those who cherish history gather in Mt. 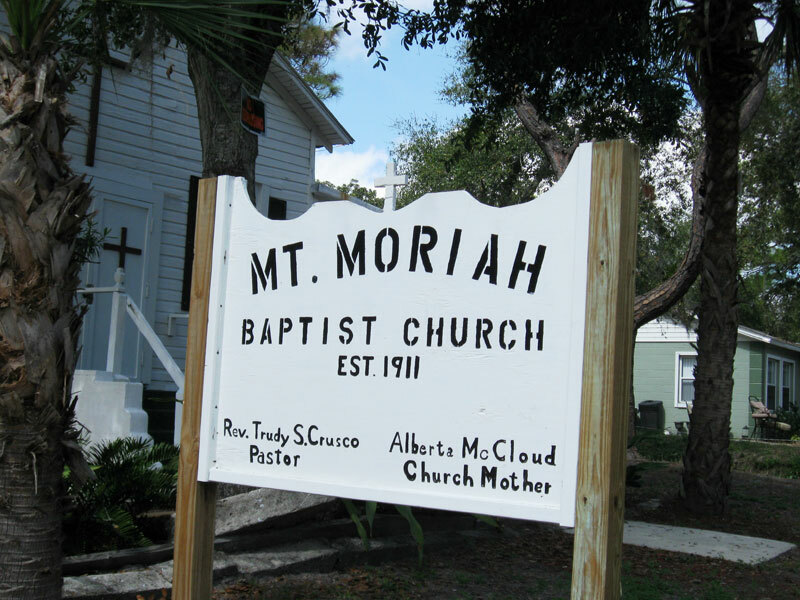 Moriah Baptist Church to celebrate this settlement that decades ago was nestled in what is now the northeast area of Port Orange. Yet, as late as the 1970s, this quiet community was lined with dirt roads and recent memories of “Miss Baby” (Rosa Bugman) who would shoot rattlesnakes with a .22 and collect their rattles in a bag. Disaster struck the sawmill business when a boat carrying equipment and funding for the sawmill sank in 1866. Today the streets of “Freemanville” can be considered to be a rectangle of roads just west of U.S. 1 in Port Orange, bordered on the south by West Ocean Avenue, on the west by Alexander Avenue, on the east by North Orange Avenue, and on the north by Valley Street. Each of the past two Februaries I’ve attended the Freemanville Day Celebration, sitting on the firm pews at Mt. Moriah (established in 1911 and rebuilt in 1956), listening to the history of Freemanville and its long-gone residents. I learned about Adam Freeman, who would keep his grassless yard neatly raked so the straight lines in the dirt yard would reveal if any snake or human intruder had come near his home. Current Port Orange Mayor Allen Green who grew up in Port Orange says that residents of Freemanville also kept guinea hens that worked as “watchdogs,” sounding alarm with loud shrieks if anyone would come near. Known as “Mother McCloud,” the church mother, she recalled raising 11 children, along with pigs, geese, and guineas in this quiet community. One day her husband brought home a goat, and another day he brought in a gopher tortoise and said that they could eat it, but she quickly corrected him – that HE could eat it. Freemanville may have been named for the Freeman family – Adam, Major, Frank, and a sister -- but their grandparents were not among the first settlers who had come to the area in 1866. The settlement was created immediately after the Civil War, when John Milton Hawks, an abolitionist and former Union Army surgeon, brought 500 freed slaves, many who had fought for the Union, with their families to the area to establish a sawmill business in nearby Ponce Inlet. Financial assistance was provided by the U.S. Freedman Bureau and another 1,000 freed slaves settled in the Port Orange area six months later. Dr. Len Lempel, a Daytona State College history professor who specializes in local and Florida African-American history, researched the beginnings of Freemanville, and I’ve learned so much from his presentations, including three (2009, 2011, and 2013) specifically about Freemanville, Hawks, and Esther Hawks who, like her husband, was a school-trained and certified physician. Esther established an integrated school in November 1866 for the sawmill workers’ children on the beach in the area of Ponce Inlet, and she wrote to The Freedmen’s Record that she and the students gathered “about a big fire” before the school was built. Eleven months later she wrote, “My school flourishes” and that her school included five white children, fifteen Blacks, and two “mulattoes,” making it the first integrated school in Volusia. All that remains of Freemanville today are the Mt. 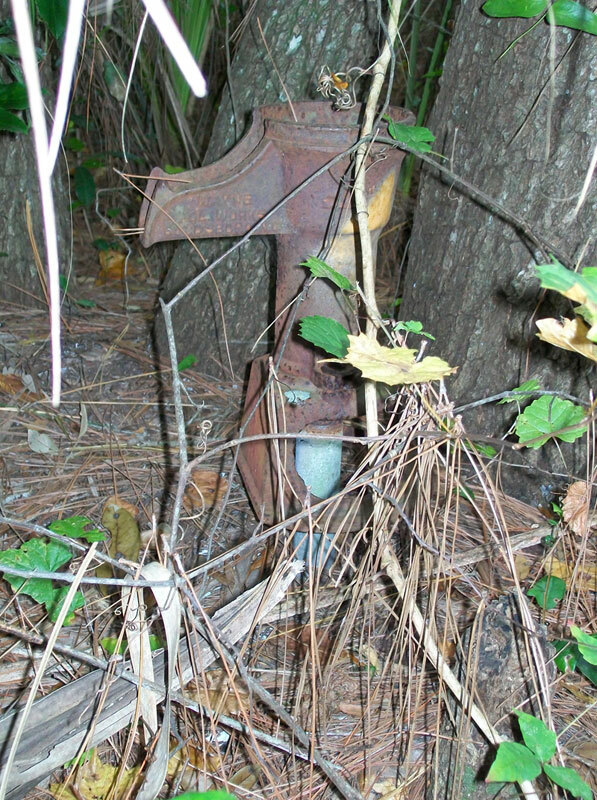 Moriah Baptist Church and this rusty pump in the woods near the church. Photo by Denny Bowden. Lempel lauds Esther Hill Hawks’s book A Woman Doctor’s Civil War Diary as well worth the reading, though it’s only about her pre-Freemanville years. Disaster struck the sawmill business when a boat carrying equipment and funding for the sawmill sank in 1866. Thousands of 1866 silver dollars went to the bottom with the ship. Vital equipment was lost, and Hawks’s sawmill business was too big to be profitable and soon failed. In addition, the assistance from the Freedmen’s Bureau was inadequate, so the majority of the workers moved away or to the Port Orange mainland to form their own community. Of the approximately 1500 Blacks who had come, only 142 adults remained by 1867, and they supported themselves with farming, fishing, and working in orange groves of others. The 11th Annual Freemanville Day Ceremony is Feb. 11 at the Mt. Moriah Baptist Church, 941 N. Orange Ave., Port Orange, at 4 p.m.
Mt. 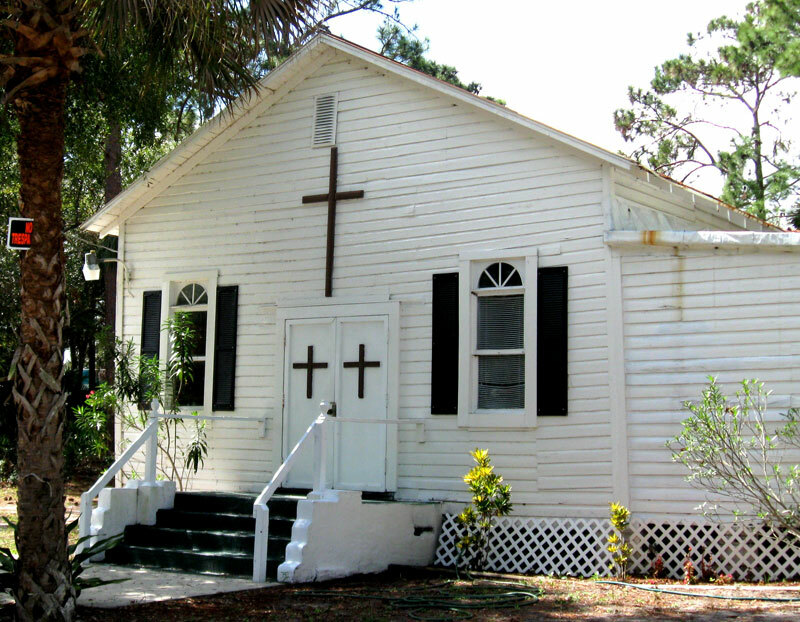 Moriah Baptist Church site at 941 N. Orange Ave., Port Orange. The Freemanville settlement was located just west of the church. later with the 11 children they had had separately in marriages during the time when they had been slaves. Henry and others are buried in Freemanville’s Gadsden Cemetery. Local historians Priscilla and Harold Cardwell have added much to the history of Freemanville, especially when they were interviewed by Bethune-Cookman University professors Mary Corliss and Dorothy Dobbins for their short book A Free Man’s Dream: The Rise and Fall of a Community, Freemanville, Florida (2003), which I bought at the Halifax Historical Museum. The Cardwells report that in the 1890s John Tolliver, son of Henry, sold the Tolliver land “back to Charles Daughtry” [sic] and that housing “lots were then traded and sold to build small cabins” in the horseshoe-shaped roads of Freemanville. John went on to successful endeavors, working as what today would be called an engineer. Lempel has researched John Tolliver’s two contracts with Daytona between 1879 and 1886 to “open” a portion of Ridgewood Avenue (later becoming part of today’s U.S. 1) – an accomplishment of local African-American business and engineering history that, thanks to Lempel, is recognized again today. By 1910, Freemanville had two churches, businesses, boardinghouses for Blacks, and the Freemanville School. Mt. Moriah Baptist Church. Photo courtesy Greg Milliken, Vintage Daytona. By 1870, the Freemanville area had 250 residents, and new jobs became available in the 1880s when the Florida East Coast Railroad laid tracks close by Freemanville. When the railroad came to town, the Freemanville School was moved from the Dunlawton site to the north part of Port Orange’s Orange Avenue. Hard times came again with the hard freezes of 1886 and the winter of 1894-95, killing many orange trees and reducing work prospects in the groves, which caused many residents of Freemanville to move to Daytona to live in three now generally forgotten Black communities –Waycross, Newtown, and Midway. By 1910 only three families remained –Alexander, Smudge, and Drummond, but by the 1920s Freemanville was at its largest, extending to both sides of two-laned Dixie Highway (later to become U.S 1). Lying just north of Port Orange, Freemanville by then had two churches, businesses, boardinghouses for Blacks, and the Freemanville School. In the 1950s, 10 to 15 families lived in the community, working in boatbuilding, netmaking and hotel work, Port Orange Mayor Allen Green recalled. Valley Street, once a main road of Freemanville, was still unpaved as late as about the year 2000. Settlement Road led to Gadsden Cemetery where, according to the Cardwells, three Black union soldiers were buried: Watson, Tolliver, and Alexander. Alexander Avenue memorializes one of those Black Civil War veterans, but no tombstones remain today because wooden markers have been lost over the years. As the Cardwells have noted, poor residents, instead, would dig up wild coontie plants or cedar trees and transplant them to mark a gravesite, knowing that they would withstand drought and freezing winters. Volusia History - Retracing Florida's Past. His work is reposted here by permission.